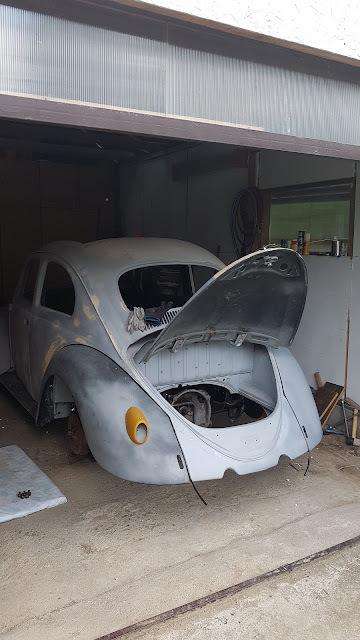 A little progress again, we had had a long weekend lately to spend on the bug. 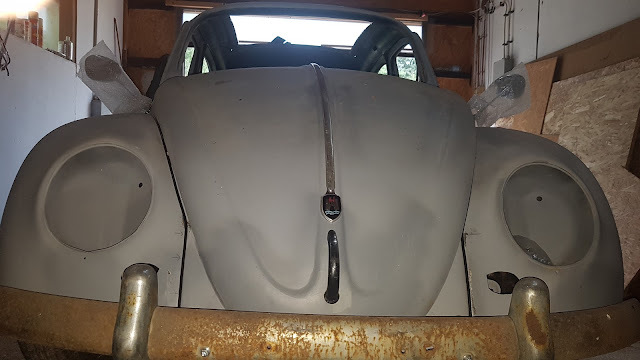 We fit the fender beading on and adjusted the fenders to their final positions, also set on the molding set and adjusted them to fit to the body. Right after these we have faced with our nemesis, the door gaps. As first we put the chassis back on the pan without putting the pan bolts on. Only the front two and rear four 10 bolts been set on without the rubber pads. To adjust the doors we have started to play with these bolts, the more you tighten the front ones the more of the upper part of the doors go down, while if the rear four ones pulled down, the back end of the chassis pulled downward. It still just the beginning of these adjustments since the passenger door also has to go backwards, therefor a few custom shims been created. Beading are on at the front too and the molding and mirrors as well. The horn grill holes are still waiting to be cut to their original shape.